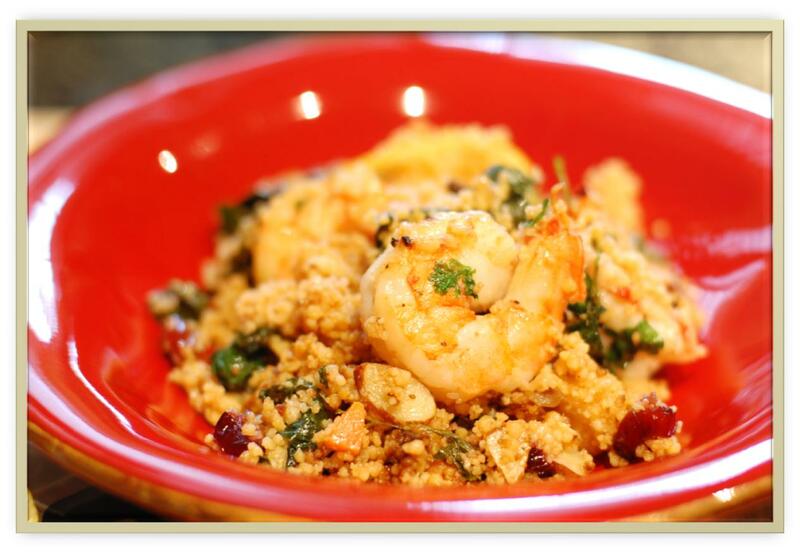 A new shrimp dish with great surprise flavors and relatively easy to put together, but one problem the unavailable Ras El Hanout the all important Moroccan spice blend. Luckily I had all the spices for the blend that someone had posted online so I made a small portion for this dinner. Have all of your ingredients ready. Heat a pan over medium heat and add a little olive oil and sauté carrots, onions and garlic for 3-5 minutes to soften the carrots and onions. Add the spinach to the pot of couscous and cook for 30 seconds to 1 minute to wilt the spinach a bit, add the tomato sauce, , dates, prunes, almonds, half the parsley and ¼ cup water and a drizzle of olive oil. Season with salt and pepper to taste and cook for 2-3 minutes or until heated through. Remove from heat and add 1/2 the lemon juice. Take off heat and set aside while you sauté the shrimp. Sauté, not boil, shrimp over med high heat until opaque should’t take more than 2 minutes in appropriately sized hot pan… take off heat and add the rest of the lemon juice, plate couscous and top with shrimp, garnish with parsley.